Finally. Enough with the ‘B’ team. On the heels of another lackluster performance by the mostly-MLS-based second (third?) string, U.S. Men’s National Team Coach Bob Bradley has called on the big guns for next Wednesday’s friendly against the Netherlands in Amsterdam. The ones that aren’t injured, that is. Notable omissions include Brian Ching, who was decent against El Salvador (and “decent” is pretty much the highest rating Ching has ever received in the USA short), fellow target striker Kenny Cooper, Greek exile Freddy Adu and Tigres left back Edgar Castillo. Those four can assume they are outside the bubble for South Africa and will need a change of fortune in the next three months to merit consideration. Most U. S. soccer fans have probably not heard the name Michael Hoyos. And they probably won’t be able to hear it in the future without cringing. Hoyos is an 18-year-old midfielder who was born in Fountain Valley, CA to Argentine parents. A few years ago, he moved with his mother and younger brother Kevin to Argentina, eventually finding his way onto the youth team at Estudiantes, a storied club in Argentina’s top division. And now, Hoyos is making appearances with the senior team. At age 18. In one the biggest leagues outside of Europe. So why the cringing? It seems Hoyos is going the way of a fellow dual-citizen, New Jersey-born Giuseppe Rossi, who famously shunned the U.S. Soccer program for glory and plaudits with Italy (not to mention two goals against the U.S. in last summer’s Confederations Cup). According to Yanks Abroad, Hoyos has been invited into Argentina’s Under-20 camp. Hoyos now appears to join the growing list of top-notch players who prefer their ancestral homelands to the Red, White and Blue, a list that also includes Serbian defender Neven Subotic. Or be doomed to watch kids from Orange County score on us in big tournaments. 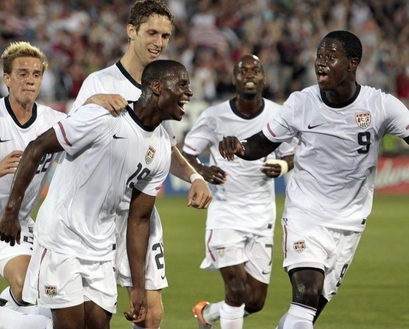 The trials of Eddie Johnson and Freddy Adu sometimes read like a Greek tragedy. Precocious young talents derailed by bad decisions, poor management and middling form. Sophocles would be all over these two. Currently stranded well outside of the US Men’s player pool, the pair are miles away from being in the conversation for a World Cup slot and only a few months to impress Nats Coach Bob Bradley. So they’ve gone to the cradle of democracy, Greece, and club side Aris Thessaloniki, to find answers. Both came on as subs last weekend and teamed up for a goal in a 2-1 loss to something called Skoda Xanthi. Both players, of course, were once thought to be the future of the National Team. 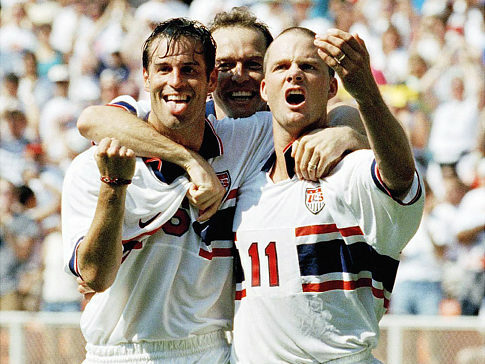 EJ made a huge splash in qualifying for the ’06 World Cup, scoring seven goals in six games, before injury and a severe dip in form derailed his playing time in Germany. Since, he’s gone from MLS to Fulham, which loaned him to Cardiff, and now onto Greece. Adu, the former prodigy and Nike marketing darling, joined him a week later, after a troubled loan spell at Beleneseses (which followed a year-long loan at Monaco, where Adu played sparingly) and the pair are hoping to re-start their dwindling chances to make the roster in South Africa. The odds are against them, but maybe a trip to the Oracle at Delphi can give the players a clearer picture. When the U.S. takes the Home Depot Center pitch this Saturday against Honduras, the most popular player on the field will be…Jonathan Bornstein? It was Bornstein’s injury time equaliser against Costa Rica in the final qualifying match that sent Honduras into the World Cup for the first time since 1982 and propelled him to Hero status in the Central American country. This, just four days after the U.S. team played the role of villain with an improbable 3-2 win over Honduras at San Pedro Sula to cement their own World Cup credentials. All was forgiven, however, after Bornstein headed his last-gasp goal. According to Soccer By Ives, Bornstein has been invited by Honduran President Roberto Michelleti to vacation in the country, should he need some R&R after the World Cup. I love this video featuring Honduran announcers. Have you ever been this happy about anything in your life? Bonus points for the Costa Rica assistant coach being the spittin’ image of John C. Reilly. Bornstein is assured of starting at left back and seems to have a stranglehold on the spot for South Africa. Saturday’s game is at 6 p.m. PST and will be broadcast on Fox Soccer Channel. Fresh off making a hilarious run for the border, Landon Donovan debuted Saturday for Everton at Emirates Stadium against home side, Arsenal. His inclusion in the starting team was something of a surprise, considering he’s been idle since skying a spot kick over the bar in MLS Cup and has only been training on Merseyside for a week. 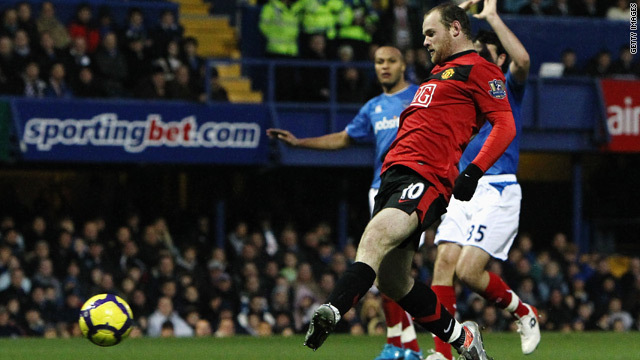 Regardless, it took him all of 12 minutes set up a Leon Osman goal off a corner. Most of the other games in the Barclay’s Premier League were cancelled on the weekend due to weather, but Donovan’s USMNT teammate Clint Dempsey led a slew of highlight shows with this cracker against Stoke mid-week. Quite a finish. Still lost to Stoke. 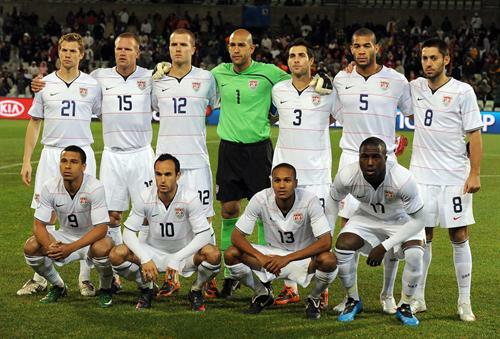 Looks like English punters will see plenty of the Americans leading up to the US-England World Cup tie on June 12. The U.S. Men’s National Team convened it’s winter training camp today in Carson, CA in preparation for a friendly on Jan. 24 at Home Depot Center. The annual camp traditionally features a number of fresh faces, as the majority of European-based starters remain with their club teams. Of the 23 called into Coach Bob Bradley’s set-up, nine are looking for their first cap. The team does include some familiar names, like midfielder Robbie Rogers and center back Chad Mashall, both of whom saw time last summer in the Gold Cup and will hope to make a bigger impression . Others played roles in qualifying, including Benny Feilhaber, Conor Casey and Jonathan Bornstein, and will provide leadership and have a chance to enhance their South Africa credentials. But the focus here is on the new guys, players can make a big impression and vault themselves into the contention for a spot with the Senior Team, and especially enticing prospect with the World Cup in South Africa just more than six months away. While this is not a simple task, one must only look back to last year, when the U.S. notched a 3-0 victory over Sweden (their ‘B’ team, to be fair) at the end of the winter camp. In that game, Sacha Kljestan scored a hat trick to send his stock rising, albiet temporarily, and a young striker by the name of Charlie Davies put in a solid first half. Both were involved in qualifying after that, with Davies stamping himself as a star. Ironically, it’s Davies’s accident/injury that might open the door for a couple of the newbies. Alejandro Bedoya, like Davies, is a Boston College product who went straight from campus to the Swedish League. The 22-year-old midfielder currently plies his trade with Orebro and made 13 appearances for the club in 2009, scoring twice. Though the U.S. midfield is considered deep, the loss of Davies might necessitate moving winger Clint Dempsey up front to partner Jozy Altidore, an option favored by many pundits, including this one. The likes of Stuart Holden and Jose Francisco Torres are sure to get first shot at any midfield openings, but the attack-minded Bedoya will view the camp as a chance to include himself in the conversation. Another former collegiate star making waves in Scandanavia is Marcus Tracy, a striker for Aalborg in Denmark. The 23-year-old M.A.C. Hermann Trophy winner from Wake Forest has two goals this season in 21 appearances. Not a great haul, but, for many young players, just breaking into a professional Starting XI is quite an accomplishment (eh, Freddy Adu?). Tracy has a ton of pace, which the U.S. loses up front with Davies out. He lacks experience, but speed is something you can’t teach.